The Whitworth Rifle was an advanced breech loading artillery piece imported by the Confederacy from England. It fired a 12 pound, 11 ounce, 2.75 inch projectile from a steel tube which used a hexagonal design rather than traditional rifling. The result was exceptional range, as much as six miles. Unfortunately, the state of observation and communications techology during the Civil War made such long range fire on land ineffective. At traditional artillery ranges where the fall of shot could be observed the Whitworth was incredibly accurate. The Whitworth rifled cannon obtains its remarkable power and accuracy by the adoption of a polygonal spiral bore of uniform pitch, more rapid than could be obtained by grooves. The 12-pounder-one of which was a few days since exhibited in this city—with a bore of 3.2 inches, has one turn in sixty inches; it is eight feet long and breech-loading. 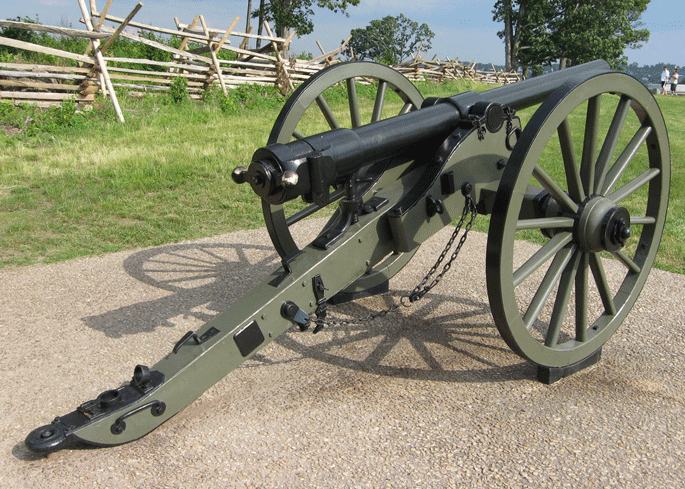 The projectile is oblong, made of cast iron, and formed to fit the grooves of the barrel. The breech of the gun is covered with a cap which screws on, and on being removed swings to one side upon a hinge ; the projectile is then inserted into the open breech, and followed by a tin cartridge-case containing the powder, and capped by a cake of wax or other lubricating composition; the breech-cap is then swung to and screwed on by its handles, a fuse inserted into the vent, and the gun is discharged. The lubricating matter being carried out with the ball effectually cleanses the gun, and the deposit is afterward withdrawn with the cartridge-case. As there is no exhalation of gases from the breech-cap, one of the worst features of breech-loading guns is avoided. The range of this gun is said to be greater than the Armstrong gun, and its accuracy more positive. Guns of the size herein described cost £300 in England. 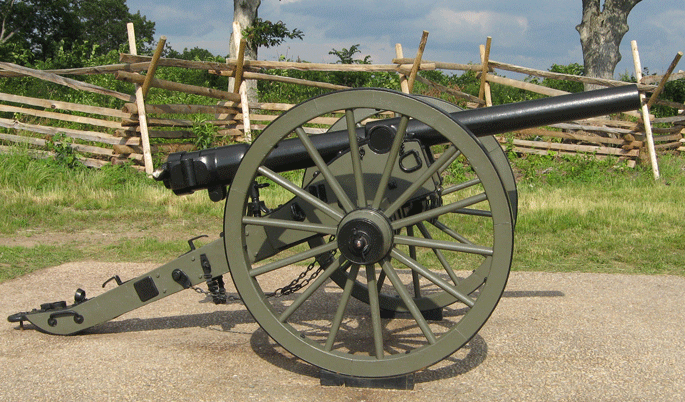 At Antietam Hardaway’s Alabama Battery and Battery E of the Sumter, Georgia, Artillery each had one Whitworth gun. By the time of the Battle of Gettysburg these were both in Hardaway’s Battery. Whitworth also manufactured a sharpshooter rifle that used the hexagonal barrel and bullet concept. A small number were used by the Confederacy.